Welcome to Angelus-Rosedale cemetery, one of the oldest and most storied cemeteries in Southern California. The resting place of six former Los Angeles Mayors and others whose names Angelenos with a knowledge of our city’s geography should recognize: David Burbank, Harvey H. Wilcox, Frederick T. Woodman. Our event at Angelus-Rosedale will consist of a walking tour of the cemetery by preservationist Laura Meyers, as well as a discussion of the planning aspects of cemeteries, and this cemetery in particular. When, how, and for whom was the cemetery founded? What determined its demographic makeup over the years? Who are some of the famous Angelinos buried at Rosdedale? 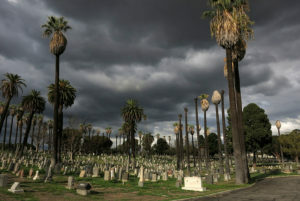 What role does the cemetery play in the identity of the West Adams neighborhood? How does the cemetery operate in the face of changing economics and trends in the burial of loved ones? What are some of the entitlement processes involved in planning cemeteries? What does the future hold? These and many other questions will be discussed. The event will wrap up around lunchtime, and those of us who are hungry will head over to Papa Cristo’s Greek Restaurant, a mainstay in the neighborhood. Presenters/Authors: Laura Meyers, Preservationist. Winner of 2013 Martin Weil Award. Laura is a West Adams neighborhood activist and advocate, noted for her research of West Adams history and for getting local buildings listed Historical Cultural Monument (HCM).